I spent some time this nice Sunday afternoon trying to catch up on some minor projects that have been languishing in a state of near-completion, or nearly-ready-for-the-paint-shop. One of these projects was a pair of 50′ boxcars from Intermountain’s 50′ PS-1 boxcar kit. The one thing I didn’t really like about this otherwise excellent kit was the tackboards for the doors. (For the uninitiated, these are wooden boards mounted on or near the doors and the ends of the cars to which hazardous materials placards, or unloading or routing instruction cards could be stapled.) These tackboards generally consist of several wooden boards in a metal frame, and are usually mounted on the door of the car (for sliding door cars) or sometimes just beside the door on plug door cars. The Intermountain kit part for the tack board has a really wide gap between the boards, which just doesn’t look right to me, so this project has been waiting on the sidelines for me to make new ones. Well, today finally I did. 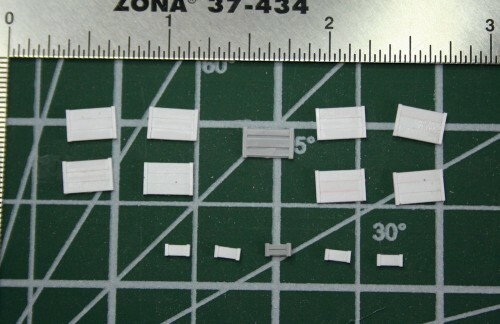 This is a simple project; the tackboards themselves are 3 strips of HO scale 2″x6″ styrene cemented side by side, with the frame represented by a piece of 2×3 at each end. The 2×3 is cemented to the main 2×6 pieces such that it stands on edge, to give a little relief to the frame. I simply find the dividing lines on the Intermountain part way too coarse. Which is odd, because I was perfectly happy with the tack board parts on several Intermountain 40′ kits I have, and you’d expect them to be similar within the product line. The smaller tack boards were similarly done, with the centre board made from a single piece of 2×6. I also got a couple of 40′ boxcar kits just about ready for the paint shop, hopefully I’ll have a chance to do some spraying tomorrow evening. This entry was posted in Other Rolling Stock and tagged Model, Scratchbuild by Chris van der Heide. Bookmark the permalink.